New York Jets outside linebacker Jordan Jenkins reportedly spent more than two months in Atlanta this offseason training with former All-Pro DE Chuck Smith, known as the “sack whisperer,” to improve his pass-rushing skills. Jenkins surged in the final quarter of the 2016 season, piling up all three of his sacks and 10 hurries during that span. 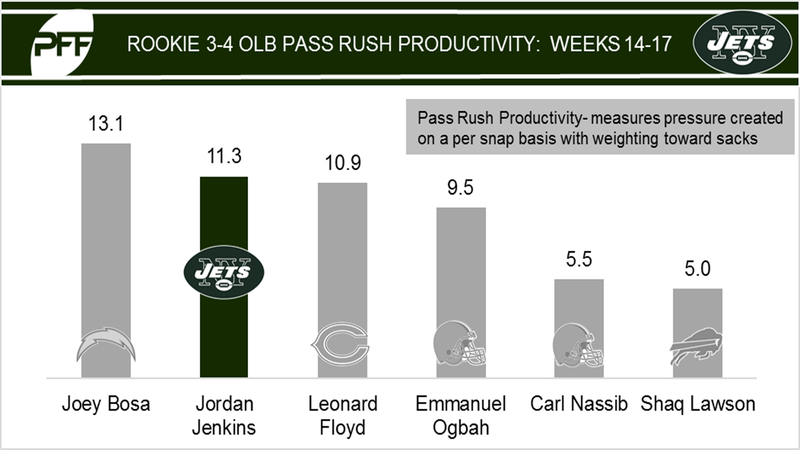 In 2016, Jenkins was one of 15 OLBs to record a pass-rushing productivity (PRP) mark above 10.0 on both sides of the line. His 10.4 PRP was the second-best mark in the AFC East behind only Buffalo Bills veteran Lorenzo Alexander (11.0). Jenkins also ranked among the top six in several signature coverage stats among 3-4 outside linebackers, including: coverage snaps per target (10.6, fourth), yards per coverage snap (0.35, third), and coverage snaps per reception (14.2, sixth).